E11 has just won it's 7th award. 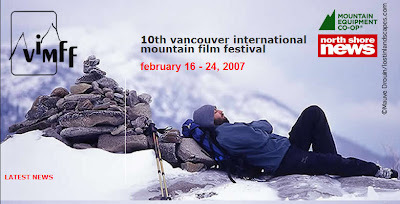 This time at the Vancouver International Mountain Film Festival. 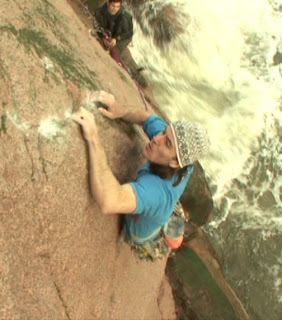 The international jury awarded E11 The Katharine Anne Rae Award for Best Film on Rockclimbing. 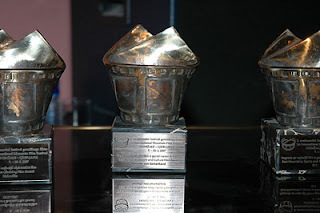 I’m thrilled to win another major award for E11 , particularly at Vancouver as E11 was up against a lot of great films there this year, including films which have already won awards at other festivals. 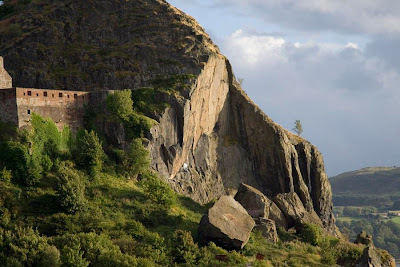 All those days I spent hanging off the top of Dumbarton Rock after ringing in work sick, now seem more than worthwhile. Most of our previous work has been shot either from a tripod or handheld (usually while hanging off the end of a rope). 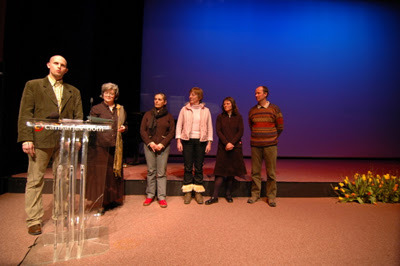 We got some feedback from Canadian filmmaker Bill Noble, one of the jury members at Banff this year. One of the things he suggested was that we should invest in a crane to give our work more ‘dynamicism’. 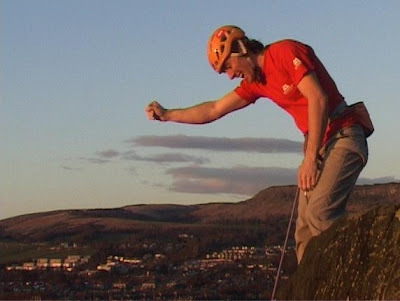 A decent professional crane cost around £10,000 which puts it a little out of reach of the budget for a climbing film. So we commissioned a couple of local engineers to build one. Steve Gourlay and Grant Nicoll at the Cut By Design Workshop. Steven and Grant used a design taken from the excellent book : ‘Killer Camera Rigs That You Can Build’. Although they did make several modification to the design themselves. The crane is 16 feet in length and is designed to break down into small seactions for ‘ease’ of carrying. I’m not sure well be taking it up the Ben. We took the crane for it’s first day out to Rothley Crag in Northumberland or ‘The County’ as the kids call it. Dave MacLeod ‘nipped’ up the excellent line of Master Blaster Arête (E7 6c) so we could give the crane it’s first real test. I think it will really come in to it’s own when filming bouldering; using it we’ll be able to follow the climber closely all the way through the problem. Although the major focus for our next climbing film, Committed, is Trad we’re planning to capture a few classic hard boulder problems for the film or at least to include as extras on the DVD. 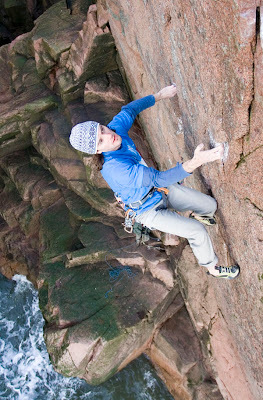 Climbing at Scottish sea-cliffs in mid February might not be the most obvious choice for a productive weekend. Don't expect sunbathing on golden beaches and a bit of deep water soloing to cool off. 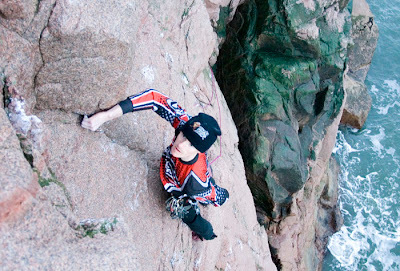 But the forecast promised good weather and so we headed North East with a couple of knarly Scottish climbers to seek out some of the east coast's hardest routes and another chapter for the new film Committed. 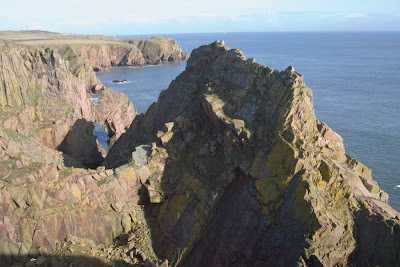 Long Haven is situated 30 miles north of Aberdeen and is home to some hard routes including Tim Rankin's addition from last year 'Comfortably Numb' which he graded E8. 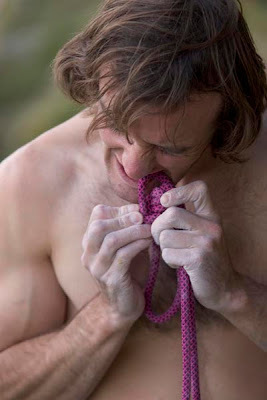 Reputedly a excellent line, Tim reacted angrily at the time to the manner of report in the climbing press criticising the style of ascent. All his gear had been preplaced (rather than placed on the lead). We arrived Saturday afternoon with Dave MacLeod and Kev Shields to find Gorden Lennox already on the route. How often do you get queue's for E8s in Scotland? So MacLeod got his onsighting head into gear and turned his attention to a good looking E7 on the front face. Already brushed and chalked up by the other party the route looked a good option to try and onsight. 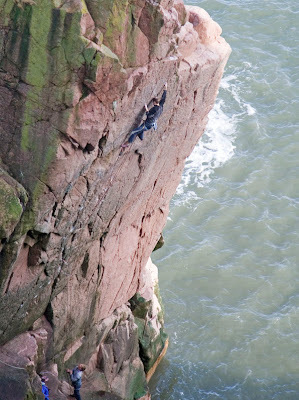 Returning early on Sunday Gordon succeeded on 'Comfortably numb', repeating the route in the same style as Rankin. With all the gear now removed MacLeod was then able to attempt in more conventional style. After a second session of working the moves and testing the gear placements he then climbed it easily on his first attempt. Over on the front face Kev Shields was in two minds over whether to attempt an E3 End Game. 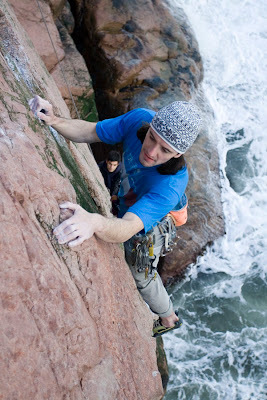 Without a normal left hand placing gear is difficult and Kev could only find one gear placement on the route. A fall at this point into the sea would be very serious. As it was beggining to get dark Kev decided to go for the lead, holding it together well. So a good weekend for all, and we could begin the long drive south. The small mountain town of Busteni in Romania is certainly not the easiest place to travel to from Scotland. 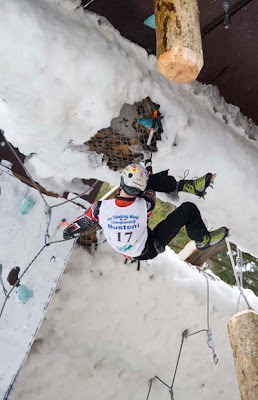 Reaching the venue of the final round of the Ice Climbing World Cup took us a round trip total of 4 train journeys, 4 flights, 3 taxis, 1 mini-bus and plenty of walking. The effort was worth it though. 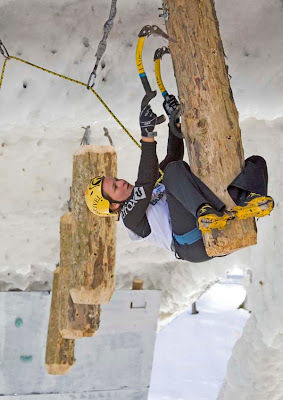 Busteni have invested 200,000 euros into an excellent ice climbing structure, 25m+ high with huge overhangs and roofs giving 30m+ ?? routes. It's a shame that a heatwave arrived two days before the comp and for a second time this year the ice routes had to be heavily modified with artificial holds. I headed out there with the two other British climbers, Fiona Murray and Kev Shields, again as a combination of photography trip and also competing myself. 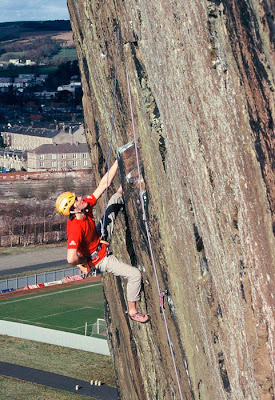 I hesitate to use the term "British Team" because unlike most competing nations, Britain does not provide any support for this form of climbing competition. 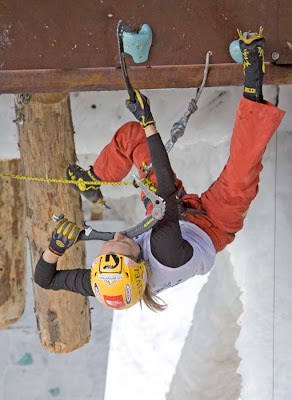 Other countries have a team selection process, provide coaching and of course fund their climbers to compete. At the opening ceremony it always feels quite odd. The "teams" parade under their nation flag. Our country doesn't even know that we're there. The competition series was very close in the men's, with Markus Bendler (Aust), Evgeny Krivocheitsev (UKR) and Alexei Tomilov (Russ) in contention for the title. 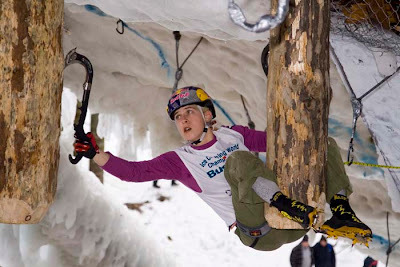 In the women's event Jenny Lavarda (It) had won the prvious two events and needed only to finish top 8 to take the series. I drew 44th starting position which meant I had to endure 7 hours in the isloation room waiting to go out and climb. The more seasoned competitors were clearly used to this and came prepared with sleeping bags and thermarests. Evgeny was out 49th and happily spent most of the time dozing away in his down coccoon. Being a long way down the starting list is also limits the opportunity for getting good photos, I missed both Fiona and Kev completely. Fiona returned to collect her gear after climbing and was fuming (at her climbing). She'd being going well then messed up on one move and suddenly got really pumped. Ended up 9th missing the final by one place. When I finally emerged from isolation I actually managed to climb quite well, really enjoyed it and got pretty high on the route. 23rd place is nothing special but it's not bad for me - just missed getting into the semi-finals. After watching the rest of the comp I learned what I did wrong at the point I came off. At certain points of a route you need to spot the solution quickly otherwise your energy drains away. Comp experience comes slowly but I'm psyched to do more and try and finish higher up. Kev Sheilds also had an ok-ish competition. He climbed well, 30th place from 49 is pretty good considering he has one hand missing, but again he's psyched to do better. 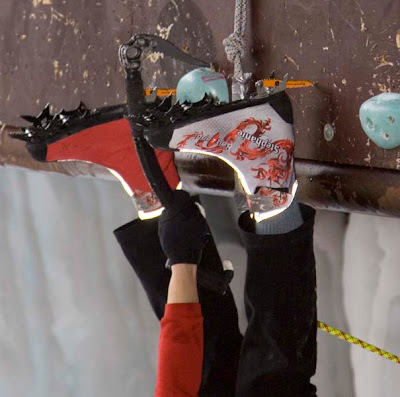 In the women's final Steph Maureau (Fr) climbed well reaching 2 holds from the top. 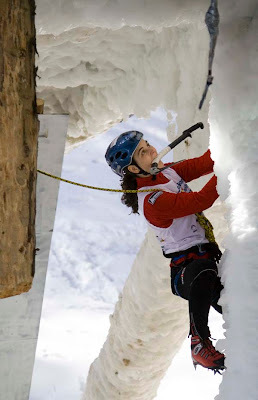 Jenny Lavarda then followed and though tiring looked like she would reach the top but made a mistake 1 hold from the top. Last out was Petra Muller (Swiss) who dug deep on her competition experience and made no mistakes to top out and win. In a slightly different order the series went to Jenny 1st, Petra 2nd and Steph 3rd. In the men's comp the final routes looked staggeringly hard. Jack Muller (Swiss) hadn't reach the top in qualifying or the semis but he seemed to find an extra endurance gear and got really high. Tomilov then powered his was to the top, cutting loose plenty but hanging on for ever. 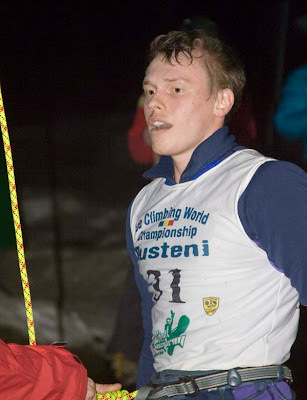 Bendler who is one of the most asthetic climbers put on a flawless display and reached the top much faster. Then Evgeny followed and almost made it look too easy, 40 seconds faster again. So Evgeny took the title and the series, Bendler 2nd and second in the series and Tomilov 3rd and also 3rd in the series. I've enjoyed the World Cup this year. 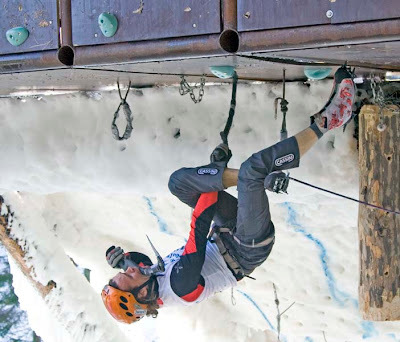 Hopefully next year the comp will be 'spur-less', which is after all the way that most of us climb these days. I almost forgot to mention my climber rescue! I was up in a crane taking photos when Maria Shabalina managed to end up in serious trouble. As she came off her ice axe handle caught on a hold and the pick impalled her on the back of her kneck. As you can imagine, hanging free suspended just by the pick of an axe in your kneck is a bit painfull. So the crane driver zoomed me over to her and I lifted her off. Fortuately no serious damage done. Phew. 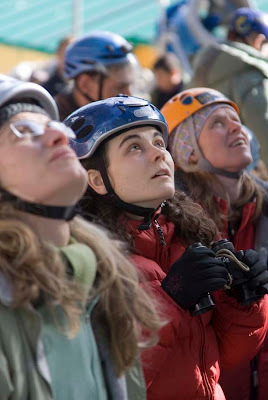 This weekend saw the first Domžale-Ljubljana Mountain Film Festival. I met the festival director Silvo Karo in the bar at Kendal this year and he told me about his plans for the festival and asked if we would enter E11. From what I see and hear the first festival was a great success, I hope we can make it over there to this festival in future years. "The award for this category goes to a film that explores the limits of personality beyond belief, pain, stamina and life goals. 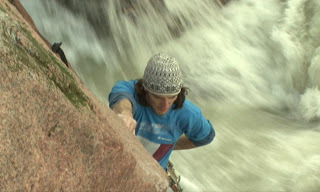 There is a clear idea by the film maker to follow this climber in all aspects of his life, both internal and external as he makes a commitment to a difficult route on a local rock. His is a small world but his aims are universal. 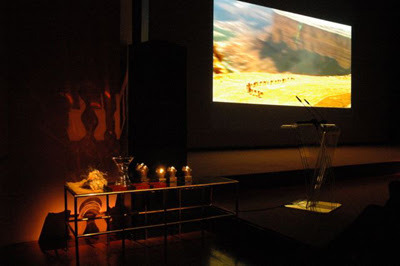 Using modern film techniques, narration, music and editing the film is entirely successful in addressing issues bigger than the climb itself – that of personal achievement. The film is E11." In addition to the awards presented by the judges, the Alpine Association of Slovenia awarded their Best Alpine Climbing Film Award to E11. I met some Slovenian climbers involved with the festival and E11 certainly seems to have made a big impression. It is probably no coincidence that the film has done well in a country that also has such a strong tradition of trad climbing. 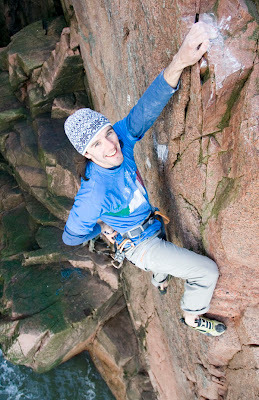 I'm psyched to get out there to get out there myself on a climbing trip soon. A lot of climbers in eastern europe were unaware that E11 is on sale on DVD. We don't have any distribution in arrangements in this part of the world, however the DVD can be purchased on-line at many websites, including direct from Dave MacLeod's own webshop.